There were similar plaudits from contemporary writers of the calibre of Ira Levin and Richard Condon. In the UK it was published in 1969 as Penguin paperback number 3017 (thanks to my spheniscid pal Keir for pointing this out http://www.flickr.com/photos/scatterkeir/2548316773/). The writing was beautiful and the widespread assumption was that the novel would live on permanently, revered as a classic. I don’t agree with Tartt that truffling around second-hand bookshops is a mean or lowly pursuit to which one is “reduced”. Some of us find it quite noble. I do share her frustration though. It pre-echoes my constant astonishment that John D. MacDonald’s Travis McGee books don’t enjoy enduring popularity. So what causes lie behind Portis’s disappearance from the literary canon? True Grit is an amazing book. It details the handful of days in which fourteen year-old Mattie Ross heads off into the Choctaw Nation with the spent, dissolute US Marshal Rooster Cogburn and the prickly Texas Ranger LaBoeuf, her only intention being to deliver justice to Tom Chaney, the man who killed her father. The novel sets itself up in an amazingly economical first chapter, and 215 pages later finishes with a beautiful coda in which Mattie relates, in a matter of paragraphs, the rest of her life. I don’t think I’ve ever read such a compelling account of how an entire life can crystallise around a single event, nor as convincing an evocation of how we all move apart in life like galaxies, no matter how important we are to each other. “Time just gets away from us,” intones Mattie at the book’s very end. Amen to that. What comes in between the introduction and the end, the actual story of the novel, does not describe a complicated curve, but the details are convincing and Portis’s writing (in the voice of an old woman, remembering events that happened to her as a young girl) is astonishing in the unwavering nature of its conviction. Best of all though the three central characters change gradually and irreversibly over the course of events, and not one of them ever refers to “going on a journey” apart from in a strict geographical sense. It is not too overblown to call True Grit a great book. That it fell from renown I think can only be blamed on the broad film adaptation that followed. The 1969 film version of True Grit is truly a film to make the guts tired. It’s lazily directed by Henry Hathaway, who at this point is coming to the end of a career verging on the illustrious, but who still has 1970’s Airport in his future. It’s catastrophically screen-written by Marguerite Roberts who misses every beat, constantly loses dramatic focus and fills her script with such deadening amounts of exposition that even that gobby bloke at the end of the third Matrix picture might think it was a bit much. She can’t even keep hold of the basic id/ego/superego pattern that the three characters in the novel suggest, like McCoy/Kirk/Spock in Star Trek or Quint/Brodie/Hooper in Jaws. But worst of all, really, it’s an extravagantly badly cast film. Kim Darby (who had played Miri in olden days “proper” Star Trek) is an awful Mattie Ross, too old, yet not worldly enough. And the stunt casting of Glen Campbell as LaBoeuf misfires very badly indeed. Why True Grit is remembered is partly for its Dennis Hopper turn, but mostly for the fact that John Wayne won a best actor Oscar for his portrayal (broad mummery, bordering on self-parody) of Rooster Cogburn. He beat both Dustin Hoffman and Jon Voight who were nominated in the same category for Midnight Cowboy. Oh Oscar. Why are you so laughably and persistently wrong? Remember in 1982 when you asserted that Gandhi was better than ET, and that Ben Kingsley was better than Paul Newman in The Verdict? Remember also that year when you gave the best supporting actor to Lou Gossett for An Officer And A Gentleman over James Mason in The Verdict? You are an idiot. So Wayne got his Oscar and there was some mileage to be got out of that, but I think the film cheapened the reputation of the book, and I further think (with noooooo evidence whatsoever) that it contributed to the book’s decline from popularity. If there is any justice the new film version of True Grit will correct this. With their 2010 movie version the Coen brothers have opted for an almost literal adaptation of the book. There are a few ellipses and one or two liberties taken, but generally this is the exact plot of the book with large swatches of dialogue rendered word for word from the page. Hailee Steinfeld is perfect in her steadfast priggishness as Mattie, providing the supporting mechanism of the film with complete confidence. Watching that degree of competence in so young an actor reminded me of Natalie Portman’s performance in Leon. And that’s as big a compliment as I am able to give. Matt Damon gives good value as LaBoeuf, once again showing that he is shaping up to be one of the standout actors of his generation, and making me sorry that still every time I see him I am shouting MATTDAYYMMONNN in my head. Team America has a lot to answer for. Josh Brolin does as much as he can with slow-witted character Chaney and Barry Pepper (so good in The Three Burials Of Melquiades Estrada, and recipient of a Razzie for his collaboration with Battlefield Earth) is a suitably weaselly Lucky Ned Pepper. But this is very much Jeff Bridges’ show, and he is tremendous as Rooster Cogburn, reclaiming the nuance of character that got blurred in the embarrassing pantomime of John Wayne’s interpretation of the role. Bridges can do the comedy, but he underscores it with the bitterness of age and defeat. His physicality is impressive, and he brings a lot of wounded-elephant grandeur to play, but he never lets you forget that underneath the misanthropy, illiteracy and orneriness – quite far underneath all that in fact – is an actual human being whose current state is the result of everything he has endured in life. The accent, I will assume, is well researched, though I felt we were only ever one “hornswoggle” away from authentic frontier gibberish. So how good of a film is True Grit in its current incarnation? There is, I contend, no such thing as a bad Coen brothers film, unless we are to be merciless and include Joel Coen’s cameo in John Landis’s execrable 1985 comedy Spies Like Us. Admittedly some of their less accessible movies like Barton Fink, The Man Who Wasn’t There and A Serious Man have failed to find a wide fan-base. And two of their comedies, The Ladykillers and Intolerable Cruelty are loudly and frequently unloved, which is a shame. The lunatic gravity of Tom Hanks’ ill-judged performance does destabilise the orbit of The Ladykillers rather, but there’s a lot left to enjoy in the film. And as for Intolerable Cruelty I would argue that Geoffrey Rush’s amazing turn goes a long way to cutting through the apparent smugness of the rest of the movie. True Grit looks beautiful courtesy of the Coen’s regular cinematographer Roger Deakins, and constant Coen composer Carter Burwell scores it up a storm. The acting is great but, I am left to ask, what’s the point of it? The book is so fluidly written, and so quick to read that in the time it takes to watch this film you could sit down and read it cover to cover. The film has no flaws at all apart from the fact that it brings absolutely nothing new to what already exists. It’s like Gus Van Sant’s inexplicable shot-for-shot remake of Psycho. No harm has been done, but you strain to find a single microgram of benefit anyone has got from the endeavour. Why was so much skill, effort and time spent on this? On a final note, some commentators have tried to infer a political agenda from the fact that Wayne plays Cogburn with an eye patch on his left eye whereas Bridges plays him with the patch over the right eye. As far as I remember in the book Cogburn is described as an old one-eyed jasper. I don’t believe it is ever specified which eye is missing. 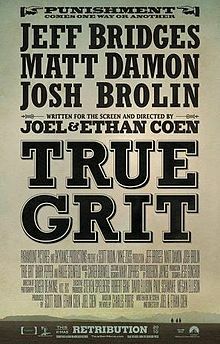 true grit book beats true grit (new) movie….in overtime….it was close. hailee and jeff were ok, but everyone else was really really good. my prejudice: the character actors make every movie better.